Welcome to day one of Lily at the Beach! I know I say this every month, but these stamps are just adorable! 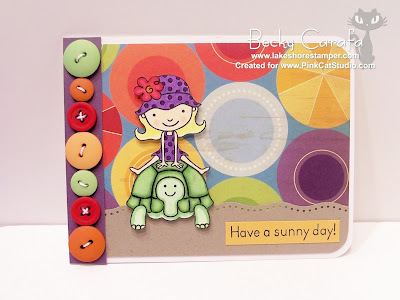 I found this Doodlebug Design paper in my stash, it's OLD, but was perfect for this set. on top of them. I also used yellow stickles on the flower centers. I cut Lily and Turtle Friend out after I colored the image, and it is popped up on dimensionals. you'll see one later this week. A big welcome to Tori Wild, this month's guest designer! Oh Becky these are both just gorgeous! My favourite has to be the one on the turtle though. 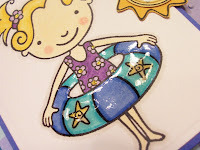 Love the gorgeous paper, it fits the summer theme so perfect, love the crystal effect too. Gorgeous as always!! Be back tomorrow!! 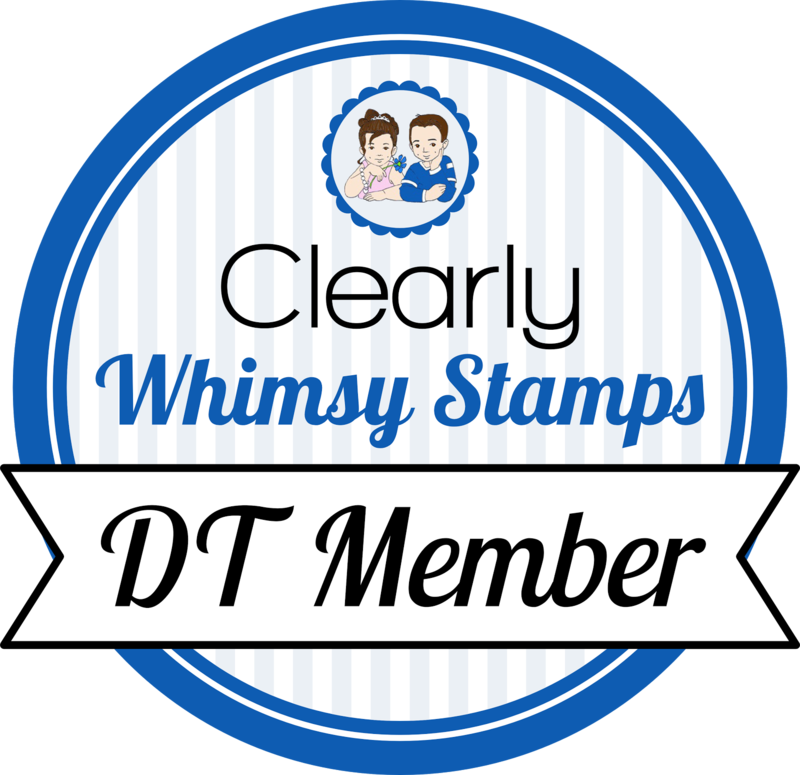 Love your paper choices for both of them and your coloring. Oh these are so adorable! What fantastic cards and the colors are perfect! Super cute cards. The coloring is just fabulous! wow! both cards are oozing cuteness! I love the dp on the second one. It looks like a bunch of beach balls or umbrella tops. TFS! The CE looks fab, and your coloring is amazing! AACCKKK!! These are adorable, Becky!! I LOVE the turtle and Lily's little hat! That paper is cool!! wow, what sunny looking cards! Perfect for Lily at the beach!! Hey I love what you did with the inner tube. It looks like plastic. Beautiful layout too. Wow, the colors on your second is so summer like. Such pretty color combos. Great use of the buttons too! I love how you added the CE on the tutrle. Beautiful job, Becky! Very cute! I love that you used blues and purples on your first card, perfect for the ocean!! Your second card has such beautiful and bold summer colors. 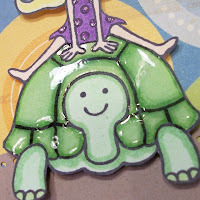 I like how you created the sand for the turtle too! Both of your cards are absolutely gorgeous Becky!!! Nice work! Both of these are just so fun and colorful Becky!!! I love that you used the glossy accents and the coloring of course is amazing! The papers though I am drooling over and the idea to put the paper behind the dew drops is a great one! I will definitely have to try that! These are all just darling and your coloring is wonderful!